Kathy Weppner is well-known on local talk radio. WASHINGTON – She has repeatedly questioned whether President Obama was born in the United States, and stated, as if it were fact, even though it’s not, that former President Bill Clinton had a sexually transmitted disease. She has reposted to the Web a wide array of far-right opinion pieces, including one that bemoans “lazy black people” who drink Colt 45 and watch Oprah and another that says that majority-Muslim nations are prone to genocide. She’s “Kathy from Williamsville,” and now she is running for Congress. Kathy Weppner, a one-time WBEN radio personality known for her right-wing Saturday afternoon talk show and her phone calls to Rush Limbaugh, is now the candidate backed by Republican Party leaders challenging Rep. Brian Higgins, D-Buffalo, in New York’s 26th Congressional District. Which raises the question: How does a tea party Republican such as Weppner – who has also reposted articles that gays and immigrants could see as inflammatory – win in a Buffalo-based district that Higgins carried by 46 points in 2012 and that Obama won by nearly 30 points that year? Weppner refused to be interviewed for this story, instead answering questions via email. “I am surprised you’d focus on the minutia of radio talk show fodder, which is nothing more than food-for-thought discussion,” she wrote. But Nicholas A. Langworthy, the Erie County Republican chairman, acknowledged that Weppner faces long odds. Noting that “the party has an obligation to run a candidate,” Langworthy said he endorsed her bid even though he doesn’t agree with everything she has said in the past. “I think that she is going to represent the values of the Republican Party in this campaign and would in Congress,” Langworthy said. 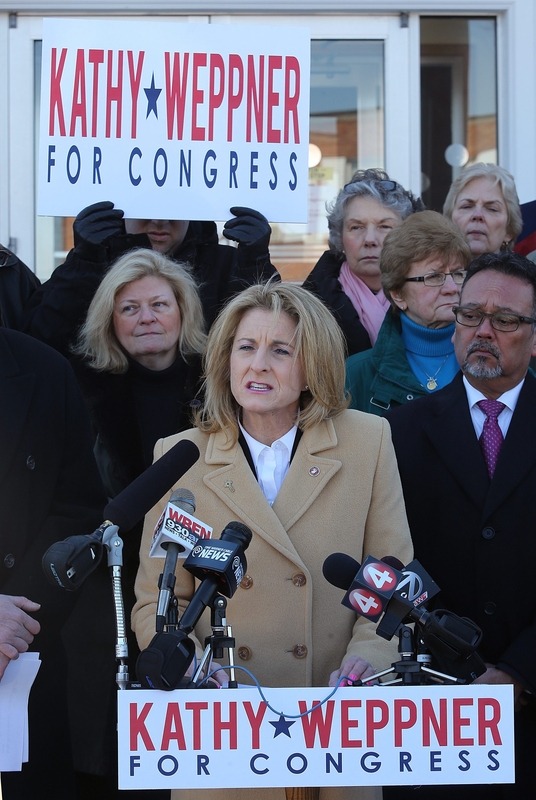 Weppner, the host of “StraightTalk with Kathy Weppner” from 2005 to 2012, declared her candidacy for Congress on March 7, surrounded by Langworthy and other Republican leaders. That prompted The Buffalo News to review some of her radio comments as well as her Web postings at http://str8talk.wordpress.com, which are preserved on the Wayback Machine Internet archive. The research shows that Weppner took a keen interest in the “birther” movement, which raised questions about whether Obama was born in the United States and, therefore, eligible to be president. Asked a follow-up question about her untrue statement about the former Republican president, Weppner cited three articles that cited allegations that he had used cocaine – but none include an admission from Bush that he used the drug. In addition to appearing on her Saturday afternoon radio program, Weppner for many years posted items – often written by someone else – to the Internet at str8talk.wordpress.com. For example, shortly after Obama’s election in 2008, she posted a piece from the Free Republic, a far-right website, called “White Guilt Is Dead.” Written by Tom Adkins, the founder of CommonConservative.com, the essay said that because the nation had elected a black president, white people no longer had any reason to feel guilty. Asked about the essay, Bill Marimow, the editor of the Inquirer, said his paper ran a similar article by Adkins, with the same theme. But the version from the Inquirer archive does not include the “Colt 45-swilling” quote and was not an Inquirer editorial but an independent opinion piece. Weppner’s blog also included several posts that were highly critical of Islam, including an essay that alleged that the odds of genocide grow along with the size of the country’s Muslim population. “After 80% expect State run ethnic cleansing and genocide: Turkey, Indonesia and UAE (United Arab Emirates),” the essay said. “THIS IS AN EXCELLENT SYNOPSIS OF ISLAM AND HOW IT WORKS,” Weppner posted. When The News asked her about the points made in that essay, Weppner cited the Ottoman Turks’ genocide of the Armenian minority a century ago – which the Turks have long disputed – and a 2001 article from the British newspaper the Guardian that detailed “ethnic cleansing perpetrated by indigenous tribal fighters” in Borneo that eventually claimed at least 500 lives. Asked if she thinks homosexuality is unnatural, Weppner evaded the question and wrote: “You apparently missed the humor and irony” of the essay.